DermaStem Lift is a new Stemtech solution to make you look instantly younger. Designed only with natural ingredients, Lift smooths fine lines and wrinkles only 15 minutes after your first application. The daily use of DermaStem Lift reinvigorates your skin, and you’ll start noticing more permanent results in only a week due to an Ayurvedic herb blend of Lecithin, Indian Gentian, and other ingredients that will give you a radiant and sheer new look. 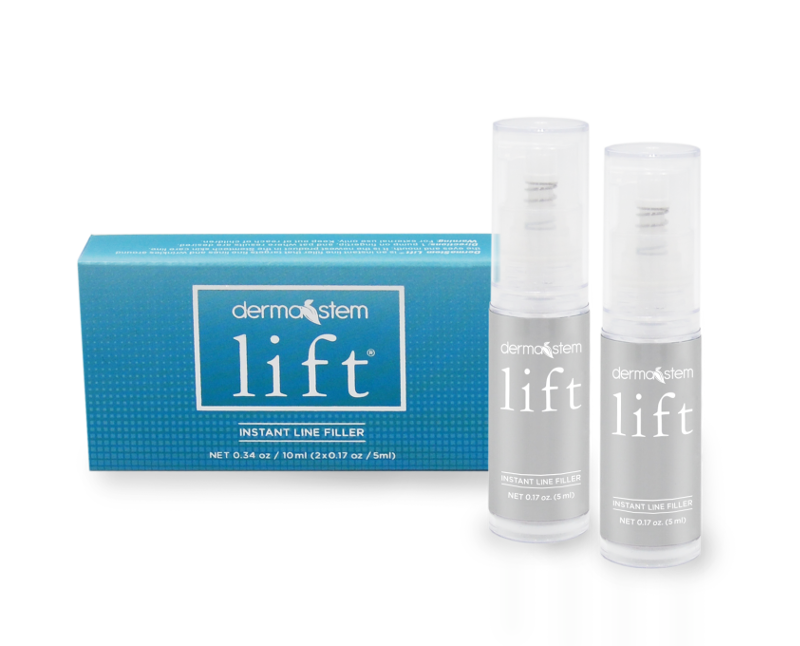 Lift was created as a complement to Stemtech’s previous skin care product, DermaStem Serum. Both are made with a combination of natural elements, but Lift is an immediate cosmetic aid for your skin, whereas DermaStem Serum is a more continuous skin rejuvenation treatment. For the ultimate results, you should use both DermaStem Serum and Lift daily as needed. Results in 15 minutes, a decrease of fine lines and wrinkles, and an effect that lasts 6 hours. A reduction of skin irritation and an increase in skin moisturizing, which results in a soft, smooth, non-greasy feel. Skin hydration for 24 hours, a smoothing of fine lines in 2 hours, and an increase of cell membrane fluidity of 40%. A “second skin” that acts as a water reservoir and helps restore the cutaneous barrier of dry, aging, and damaged skin. Improvement of skin elasticity, protection against some UV damage and environmental pollutants. Squalane is a totally plant-based component that prevents moisture loss while restoring the skin’s flexibility. Squalane leaves a soft, non-greasy feeling on your skin, and tightens your pores for a quick wrinkle reduction. This ingredient component gives you a “second skin,” a protective layer that melts on the skin during application and acts as a reservoir of water and active molecules that keep your skin adequately hydrated. This is the active ingredient that makes DermaStem Lift good for men, too. The olive extract may be used by men as an amazing after-shave moisturizer and it helps maintain skin hydration. Dermastem Lift contains also plant-based fulvic acid, a free radical scavenger with more than 70 natural minerals that help supply vital electrolytes and assist the cellular response of your skin.